HOW DID YOU FEEL WHEN YOU WERE TOLD OF PLANS TO NOVELISE NEW SERIES DOCTOR WHO EPISODES? RTD: I was very excited! I’d collected Target books as a kid, so it felt like closing a circle. And I wanted to test myself too, I was interested to find out what the process would be like. And to look back on an old piece of work after 13 years was fascinating. SM: Well, surprised – I knew nothing of the plans, because this all started around the time I was leaving. The biggest surprise, though, was that I actually wanted to novelise The Day Of The Doctor. I had a hell of a time on that script, I had no idea I wanted to revisit it! WHAT DID THE ORIGINAL TARGET DOCTOR WHO BOOKS MEAN TO YOU, GROWING UP? RTD: I loved them. I’ve still got them all, on a shelf here in my office! In the days before DVD or streaming, they were the only official records of an adventure. And they were so mysterious, detailing stories we thought we’d never see again. Some we still won’t, because they’re missing from the archive. I can probably tell you where I was, which shop I was in when I bought it, for every single one of my Target originals. SM: Every time I’d go to a bookshop – and I was a keen reader, so I went a lot – I’d head straight to the Doctor Who book section. Because I’d stared at all the book covers I already owned with such manic intensity, they were carved into my brain like wounds – so I could tell from right across the shop, by the tiniest variation in colour or artwork, if there was a new one on the shelf, and if there was my heart would leap. Then, sometimes, I’d wake up. So you could say I was – y’know – over invested. I think that’s the polite way of putting it. WHAT ELSE DID YOU READ AS A CHILD? DID THE ORIGINAL TARGETS LEAD YOU INTO OTHER SERIES OR AUTHORS? RTD: I read anything and everything. Enid Blyton! Tolkien. C.S. Lewis. Agatha Christie. Dune. Jaws. I was a voracious reader, I still am, I was trying D.H. Lawrence by the time I was 11. A lot of young readers will tell you that Targets led them onto many other books, which is brilliant, but frankly, I was there already! SM: I’m very old, so I was already a voracious reader before the Target series got started – I loved the Narnia books, and The Hobbit, and especially Tom’s Midnight Garden. Reading and Doctor Who were my two favourite things. But the thing I wanted more than anything was to combine my enthusiasms. I longed for there to be Doctor Who books! There were Star Trek books, so it didn’t seem fair there weren’t any Doctor Who ones. And then, suddenly there they were. I was on holiday in Cornwall, in a little town called Mevagissey, and in a shop called Dunns there was a solitary rack of books which I’d always walk round and round, looking for something to read – then one day my Dad grabbed and my arm and pointed to the bottom row of paperbacks: Doctor Who And The Daleks, Doctor Who And The Zarbi and Doctor Who And The Crusaders. I was so happy! HOW DID YOU APPROACH THE TASK OF NOVELISING YOUR OWN SCRIPT? RTD: It was tricky, I wanted to capture the essence of the TV episode, but I didn’t want to repeat it. I’d long since lost the scripts! I’m always asked to give away Doctor Who stuff for raffles and prizes, so everything has gone. I found a transcript online, and someone found me a copy of the very first draft. But I didn’t always look at them. I was a bit more freefalling. Or rather, I wanted to add stuff to most of the dialogue because I knew fans would know a lot of it off by heart already, so there had to be new things to discover. SM: I just sort of started. I had a few ideas about how it might translate, but really, as with any writing, I just dived in. I found the shooting script on my hard drive, and was shocked to see how much I’d altered it during filming. Quite often, I’d have to watch the DVD and transcribe useful bits of dialogue, because I found I had no written record of really quite important scenes. Then, of course, you find the parts that don’t quite work in prose. The shock of seeing David and Matt together, John Hurt as the Doctor, surprise appearances by Tom Baker and Peter Capaldi – you have to find a way to make those moments work in a book, without surprise guest stars, which can be a challenge. HOW DID THE EXPERIENCE OF WRITING A NOVEL COMPARE TO WRITING A TV SCRIPT? RTD: It’s all hard work! But it’s a different focus. That became clear with the character of Mickey, Rose’s long-suffering boyfriend. On screen, played brilliantly by Noel Clarke, he flies past, he’s wonderful, he’s fast and fun and furious, but when a novel goes inside someone’s head, I had to give him more focus. Also, bear in mind, on TV, I knew I had 13 episodes to tell Mickey’s story, but in a one-off book, I had to complete him a bit more. SM: When you write a screenplay, you make the audience a witness to events. When you write a book, you make the reader experience them. You go from the grandeur of spectacle to the intimacy of inside someone’s head. I don’t think either is better than the other, but they are different. Twists and turns, suspense, humour – they all work in different ways. You’re aiming for the same effects, but by other means. IN A WORLD WHERE THE ORIGINAL SHOW CAN BE ACCESSED IN A DOZEN WAYS ON DEMAND, WHAT PLACE DOES A NOVELISATION HAVE? RTD: New stuff! Newness. Sheer newness. New action, new dialogue and new insights. A fan might have seen something a dozen times, so I felt honour-bound to add things that could only be found inside the pages of the book. And I know what fandom feels like, there’s nothing we love more than discovering something new about something old. SM: Well, we’ll find out, won’t we? Back when the Targets started, those books were our only permanent record. The shows were on your telly exactly once, and then disappeared forever, like smoke up the chimney. Back then, Terrance Dicks would give us perfect, prose replicas of the originals, scene for scene, line for line, and very brilliantly done. He’d also do sly little fixes on the plotting when he felt inclined. But a few years later – from about Peter Davison on, I think – we all had VCRs, and we could keep the originals exactly as they were so we didn’t need the prose replicas. So the Target books changed – more of the original writers got involved, and they became more like alternative versions. Perhaps that’s how it will go now? As I say, we’ll find out. WERE YOU TEMPTED TO ‘GO BIGGER’ WITH THE ACTION, UNFETTERED BY BUDGET? RTD: Oh, a bit. A lot! Bear in mind, there’s a great big invasion of London by shop-window dummies at the end, so I’d paved the way for some epic action. On screen, the London Eye just sits there in the background. In this version, it’s a lot more involved! I loved writing that stuff. And writing action is hard – seeing a bullet fly on screen is easy, describing it in prose is much harder, so that was a good test. SM: Sometimes, yes. I don’t think it’s the big difference. In a way, many of the finest creative decisions in Doctor Who are direct responses to budgetary limitations – there’s a reason the Doctor’s space ship looks like a phone box, and he spends a lot of time in dark tunnels – so its good to go epic, so long as you don’t lose the signature style. I’m not the first person to say it, but the clash of the epic and domestic is a big part of what makes the show what it is. REVISITING AND RE-PRESENTING PAST WORK – DID YOU FEEL NOSTALGIC? RTD: I just felt old! But I felt mighty proud. Rose was the first episode in 2005, and for all the changes to the show, it’s fundamentally still the same show. SM: Too soon for me. Day was only five years ago, and I’ve barely finished as showrunner. I don’t think I’ll ever feel nostalgia for Doctor Who, exactly – I think it will just carry on being my favourite show on TV, and I’ll have fond memories of having worked on it once. WITH THESE NOVELISATIONS UNDER YOUR BELT WOULD YOU CONSIDER WRITING FURTHER BOOKS – EITHER FOR WHO OR SOMETHING ELSE ENTIRELY? RTD: I think it’s more exciting to consider something new, now. I really loved writing this, and I think the chance to write brand new stories with brand new characters would be exhilarating. One day! SM: Hugely enjoyed writing the book. Very much indeed. So yes, I hope I get another go at prose, in whatever form. Now, this looks interesting. BBC Books Publishing Director Albert DePetrillo has acquired Doctor Who: Now We Are Six Hundred, the very first collection of Time Lord verse. BBC Books have world rights, with North American rights sold to HarperCollins. 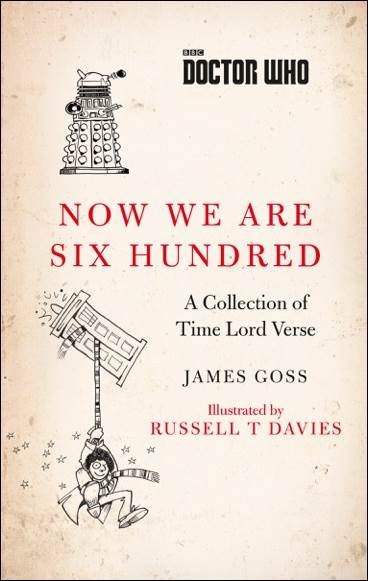 A gentle and humorous riff on the classic Now We Are Six, this is a collection of charming, funny and whimsical poems that celebrate the joys, sorrows, and wonders of Time Lord life. Written by author James Goss, the book features illustrations by former Doctor Who Executive Producer Russell T Davies – his first role as an illustrator, using the comic artist skills he developed in his youth. Doctor Who: Now We Are Six Hundred will publish in hardback on 14th September, two weeks before National Poetry Day on 28th September. 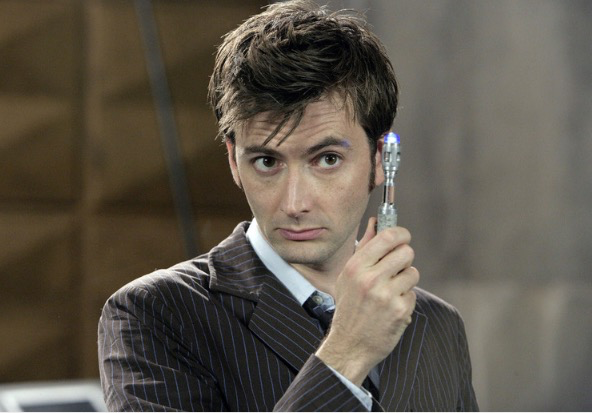 David Tennant in series 9? 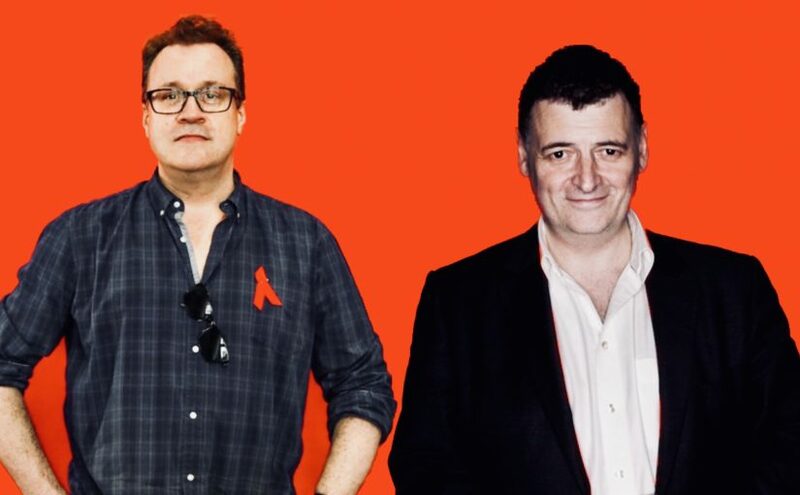 It’s now a well known fact that both David Tennant and former Doctor Who show runner Russell T Davies are in Cardiff. We just don’t know why. Online speculation has been rife that Tennant is filming for the series 9 finale. The rumour is that the series will culminate with the Twelfth Doctor returning to Pompeii and finding out just why he has that face. In the first promo picture for series 9, Pompeii is in the background of the right hand side. The current show runner Steven Moffat has said that will be addressed this series. Now, this doesn’t necessarily mean David Tennant is actually appearing in an episode. Former Doctor Who executives, Jane Tranter and Julie Gardner have just launched Bad Wolf Productions, which is based in Cardiff. It’s entirely possible that both Tennant and Davies are there to talk about working on a new unrelated show. Why wouldn’t they pop in the Doctor Who set whilst in town? What do you think? Hit me up on Twitter. 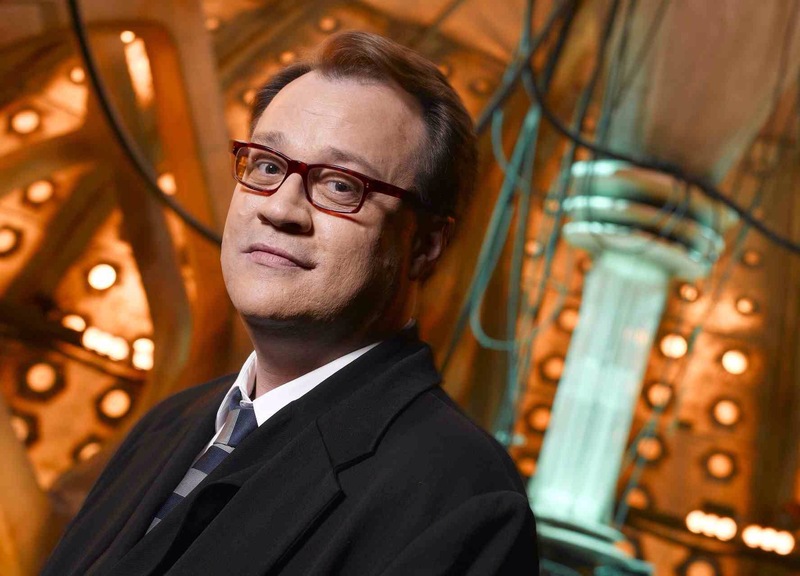 Former Doctor Who scribe Russell T Davies has ruled out returning to write another TV episode, he would however be interested in writing a Doctor Who movie. I would love to see RTD return to the Whoniverse, maybe one day we could see he and Moffat team up to write a big screen adventure.